In 1963, Peter Hall and John Barton crafted a defining trilogy – The Wars of the Roses, out of the texts of Richard III and the three parts of Henry VI. It was a production that would bring global attention to the newly formed Royal Shakespeare Company. In 2015, director Trevor Nunn attempted a similar feat with his production of The Wars of the Roses which was a 9-hour experience of these four plays, that took place on an entire Saturday. In Austin Pendleton’s 2018 production of Wars of the Roses: Henry VI & Richard III he compresses Henry VI part 3 and Richard III, for the first time, into a three-hour highlights package. It’s Game of Thrones for the theatre – political intrigue, tyrants, sexual scandals and bloodshed, as a nation goes to war with itself. It is a timely, relevant piece for the U.S. as we can witness civil chaos and societal fallout mirrored to us from this theatrical vivisection of political abuse. Historically, The Wars of the Roses encapsulates the bloody power struggle between the House of Lancaster (red rose) and the House of York (white rose) to take control of the throne of England. Between 1455 and 1487 these two warring branches of the royal House of Plantagenet engaged in civil wars that would result in the eradication of the male lines of both families. Shakespeare used this epic conflict as the fertile source of eight of his plays. Pendleton’s exquisite interweaving of the texts of these two Shakespearian plays creates an extended discussion between centuries. The abuse of power is nothing new to civilization, we just repeat the same situation of battling it out for the “seat” at any cost. It seems we still have major difficulty in governing ourselves and others – as everything boils down to petty squabbles stoked by the diminutive egos of the “men” in charge. In Wars of the Roses: Henry VI & Richard III we are following the journey that shaped the tyranny of Richard III and his relentless pursuit to sit on the throne of England. It’s three hours of death watching and seduction. What I really appreciated about this production was the evidence of hard work on text analysis to extract meaning. The conversational tone created by the cast allowed for easy absorption of the text with clear intentions conveyed throughout. Austin Pendleton’s exacting direction puts the focus on the performer, and does not distract from the story with extraneous set and props. He used the small space to maximum effect with the cast seated on stage, and only had them occasionally exiting when absolutely necessary. We did not have to sit through any battle sequences and the multiple murders were dealt with cleverly. Pendleton gave us a great Henry VI – a kind of a disheveled philosophy professor type who is trying to hold onto his seat of power, his “tenure”, only for his lifetime. A quiet, introspective man, lounging on the edge of his seat, self-absorbed and bookish -separate from all other action and the repercussions of his decisions on those around him. He was an observer of the piece and stood out from it. 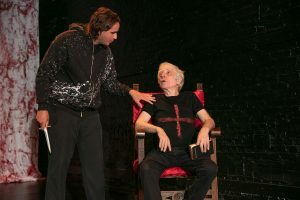 The role of director and Henry VI merged on stage. I liked his silent tread through the work. 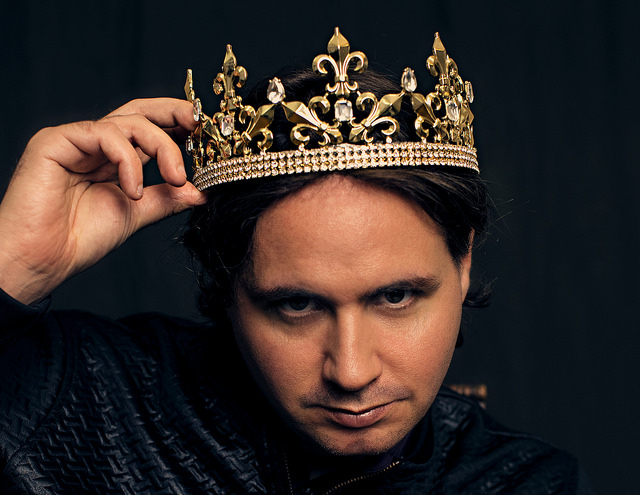 Matt de Rogatis, as Richard III, presented a boyish millennial with a brutal temper tantrum trigger. The iambic pentameter sat well in his mouth as he easily conveyed meaning in every scene. Rogatis has a strong presence on stage and has a few truly exceptional moments. However, he did not manage to inhabit Richard III’s disabled physicality. His chosen hand position slipped throughout the play and the rest of the body was just a hunched over back with bent knees and I didn’t feel any straining against his body’s limitations. The position often cut off his center so he did not have enough breath support in places. While he could brilliantly engage with Richard III’s anger he did not manage to completely embody the seductive charm of the character. The most impressive performance of the production came from Pete McElligott as Clarence. His vocal presence was in another league to his fellow cast mates and his performance energy was robust and vital. He gave a mesmerizing, honest and convincing performance. Johanna Leister gave us a feisty, intelligent Queen Elizabeth. She is a consummate performer and I loved her final scene with Richard III where she portrayed a smorgasbord of intense emotions with heartfelt vigor, pain and passion. Greg Pragel as Clifford/Buckingham brought a much needed surge of energy every time he came onto the stage. He gave an emotionally nuanced performance with a powerful physicality and has a good vocal timbre. Debra Lass as Queen Margaret was a potent force and delivered a highly believable multi-faceted character. I thought Milton Elliot, as the second murderer, was delightful. He completely found the humor in the horror and his commitment to the scene was quite brilliant. John L. Payne was a solid anchor in the piece bringing a grounded energy to his characters. Overall, I was not convinced of the casting. There were many interesting and talented performers on the stage but there was a lot of mismatched energies and I didn’t feel that the personal relationships – especially in the seduction scenes, were believable. Many of the performers were picking up on each others vocal energy and rhythm so the play lacked dynamism and pace. There was a sense of energetic flatlining. Perhaps too much focus on naturalism, which created a low energy? I think Shakespeare requires a muscularity in it’s expression and a physical wrestling with the words. This production felt very low key, like an actor’s showcase in a small studio space. But many of the audience assembled leapt to their feet at curtain call and I overheard loads of people at interval and afterwards extolling the many virtues of the show, some of which I did not share. Running time: 3hrs 25 minutes including one 15-min intermission. Wars of the Roses: Henry VI & Richard III runs August 1 – 19, at 124 Bank Street Theatre For more information and tickets visit www.proveavillain.com.